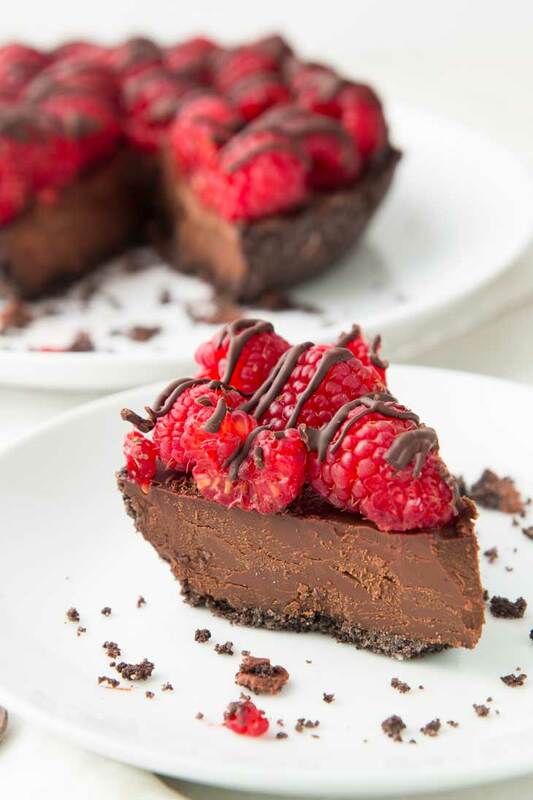 No one needs an excuse to enjoy chocolate, especially when you have this decadent easy no-bake Vegan Chocolate Pie recipe! It’s allergen-friendly, quick and easy to make, and the perfect dessert for two or chocolate fix for any time of the year! Let’s be honest…no one really needs an excuse to indulge in some daily chocolate. 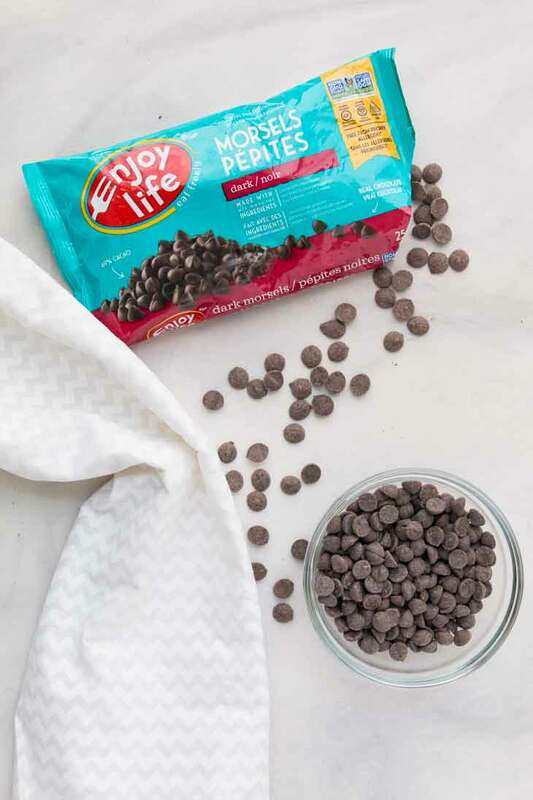 I’m definitely not shy when it comes to enjoying in a few dark chocolate chips each day; drizzling melted chocolate on your favorite ice cream, sprinkling chocolate chips on your morning pancakes or oatmeal, or simply popping a few in your mouth as you graze by your pantry. My love for dark chocolate goes deep. Even though chocolate is in season all year long in our house, it feels extra special this time of the year because of Valentine’s Day. 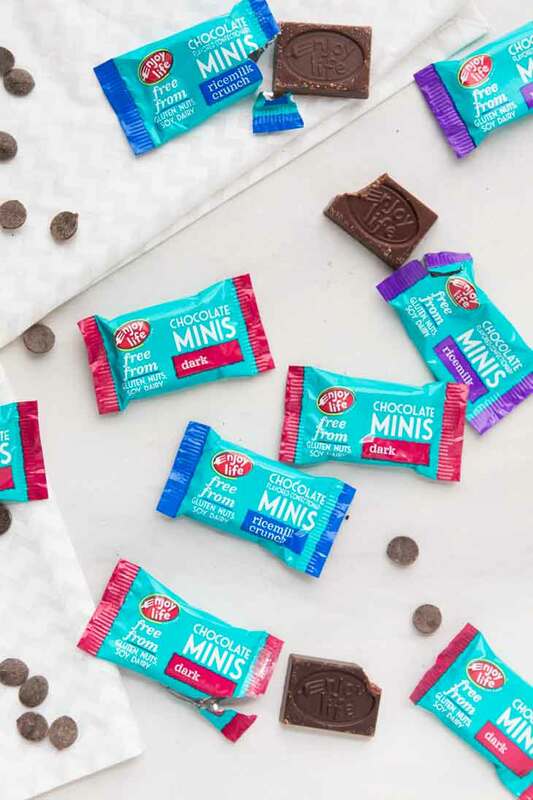 And instead of simply enjoying some chocolate chips, February brings along that additional urge to indulge in a decadent chocolate dessert or treat. 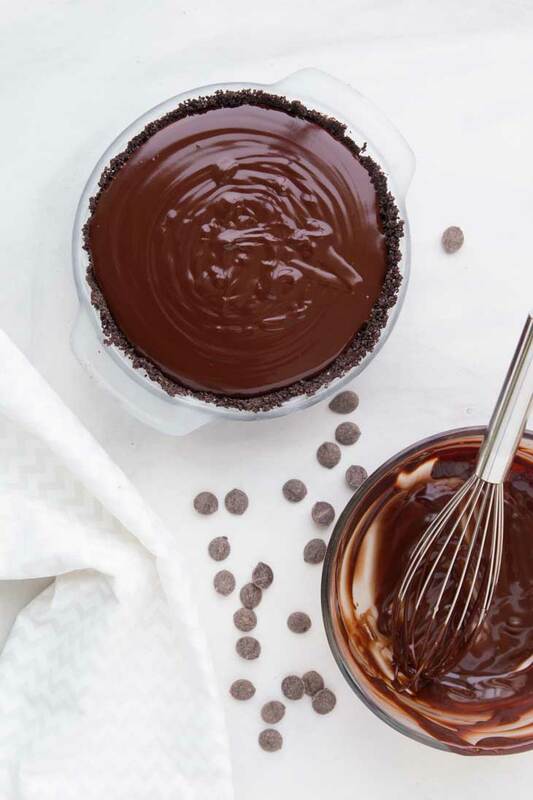 So I decided to create this super easy no-bake Vegan Chocolate Pie recipe to satisfy your love of chocolate! What Makes This The Best Chocolate Pie Recipe? 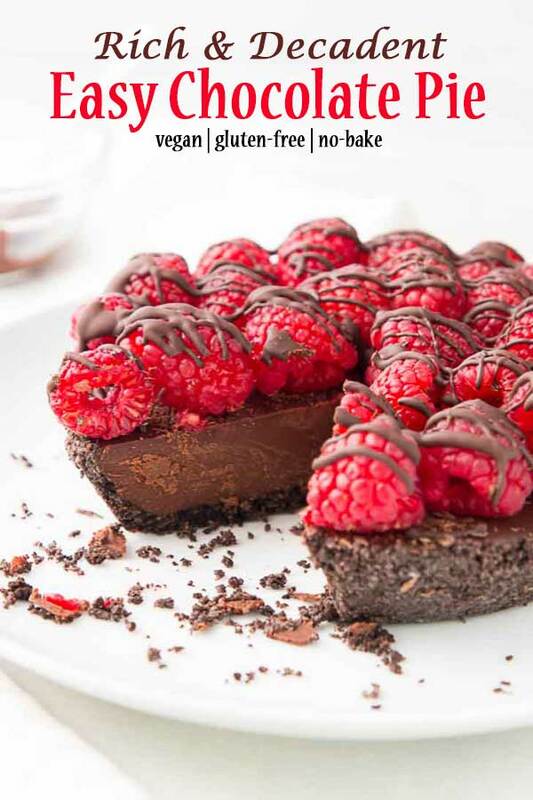 This is one of the best vegan chocolate pie recipes I’ve ever made. 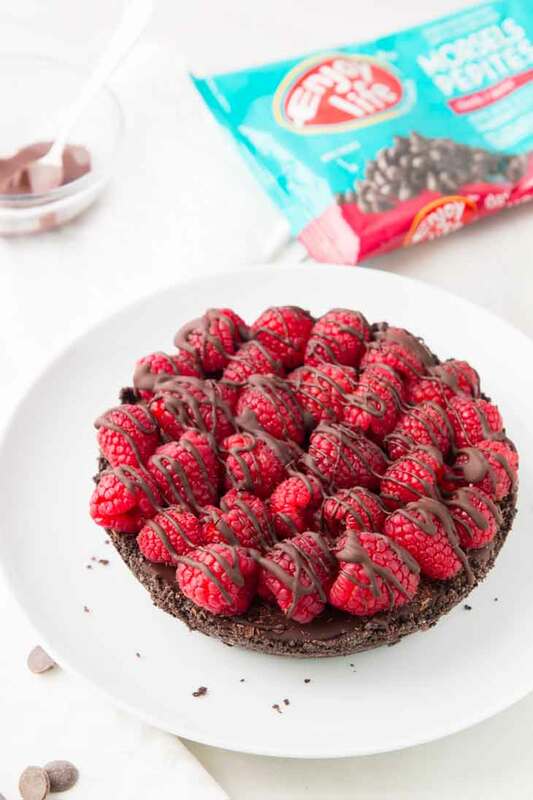 It’s easy to make, made for two (perfect for sharing), is no-bake, has a chocolate raspberry pairing for that perfect sweet & tart combination, and most importantly, this pie is allergen-friendly! I wanted this vegan chocolate pie to have that rich creamy deep chocolate taste. So no fancy ingredients that take over that chocolatey flavor profile. That being said, this pie is very easy to make! No double broiler necessary, and no steam melting of chocolate. Instead, simply heat up some coconut milk, pour it over the chocolate chips, and wait for the pie filling to make itself. The only bit of work is making the chocolate crust. 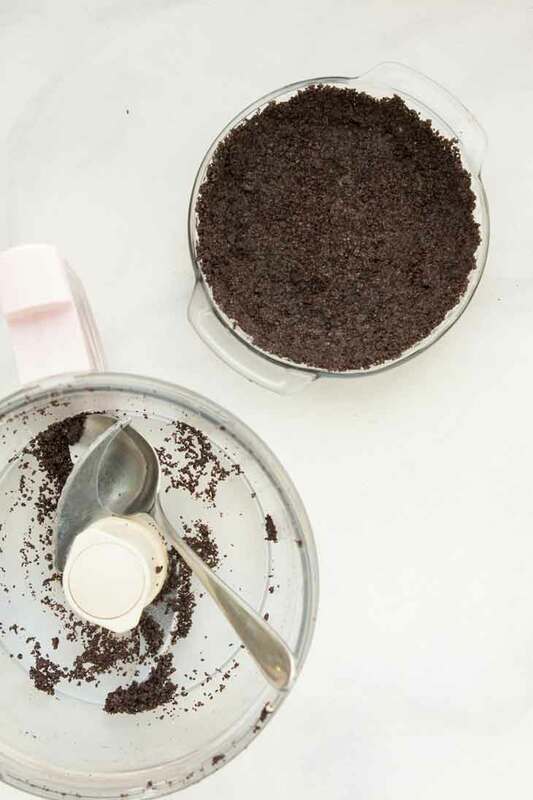 You can easily buy store-bought chocolate cookie pie crust, but if you have allergies or dietary restrictions, this pie crust recipe is one of the quickest and easiest I’ve ever made. I’m all about having a leftover pie to enjoy throughout the week, but sometimes for special occasions or if you’re craving chocolate yourself, you don’t want to bust out a gigantic pie. This recipe is for a mini pie that serves 4-5 people. Of course, you can easily double the recipe to make a larger size if you prefer. I’m all about no-bake desserts these days. Just mix it up an place it in the fridge to set instead of baking it in the oven. So much easier, and just as rich and decadent! 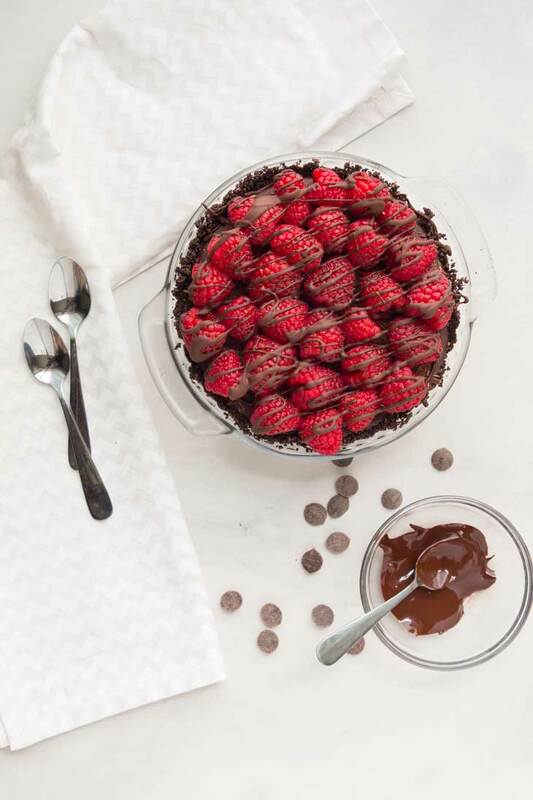 One of my favorite combinations of dessert is chocolate and fruit, specifically strawberries and raspberries. It’s something about that rich sweet dark chocolate taste combined with the tart flavor of the berries. Plus with Valentine’s Day this month, who can resist that gorgeous red berry color right? 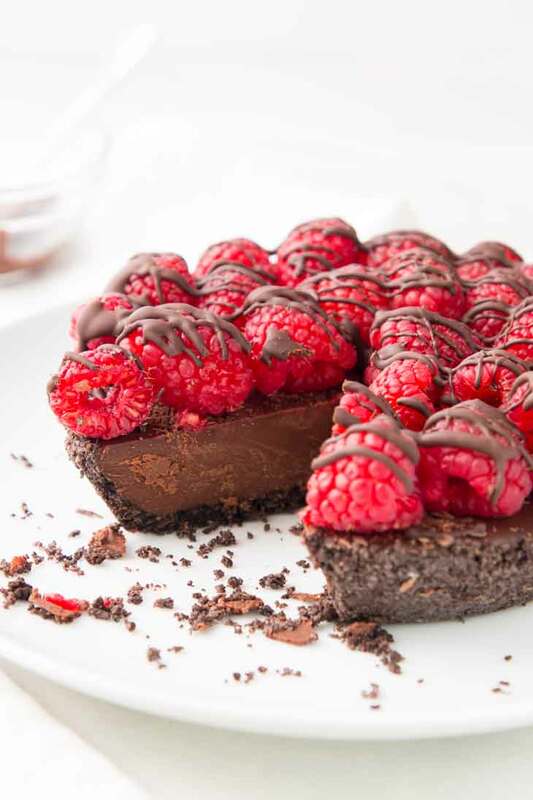 For this dessert, since I really made it all about the chocolate, I prefer raspberries since they are generally more tart than strawberries. When it comes to certain holidays, people who have dietary restrictions or certain allergies can sometimes feel left out. 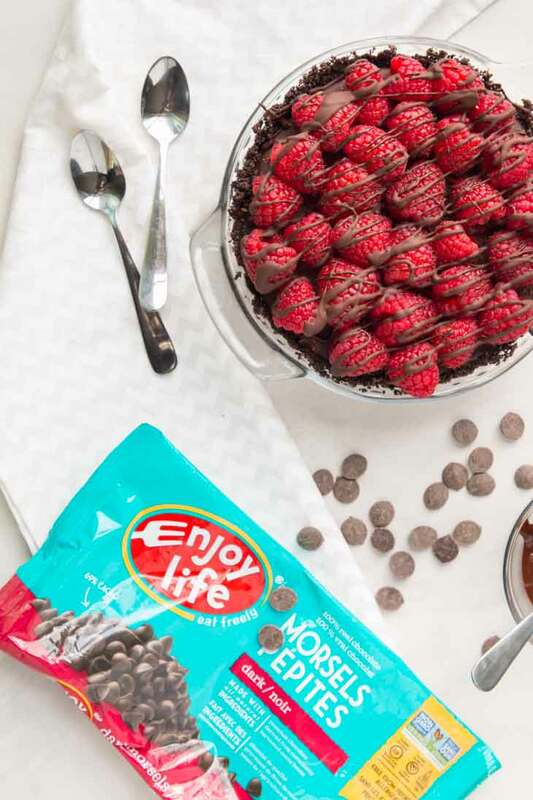 So I came up with a decadent chocolate dessert that can easily be made allergen-friendly through the use of my favorite Enjoy Life Foods baking chocolate! Chocolate, especially when it comes to baking chocolate, is something I’ve always been very particular about. And yes…you can call me a snob when it comes to finding the best chocolate chips around. When I first went vegan, chocolate was the first thing that came to mind…would I find good quality vegan dark chocolate chips for all my baking needs? 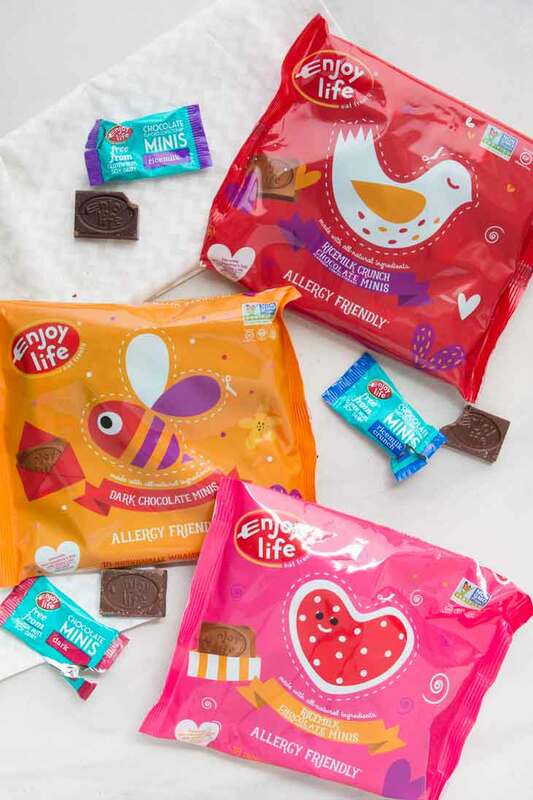 Not only does Enjoy Life Foods have loads of awesome snacks, cookies, and bars, but they also come out with fun seasonal chocolates which are huge for our family! We truly love the Enjoy Life products! Even though my kids are very comfortable being vegan and choosing vegan diets on their own, I’m not going to lie and say they never feel left out. Especially during holidays like Valentine’s Day when seasonal chocolate candies are everywhere. Or grab a variety pack which includes all three. My kids have been loving them in their school lunches, especially the variety pack, and they make the perfect special treat for your loved ones this month! If you’re making your own easy pie crust, pulse the chocolate cookies with some vegan butter until they turn into fine crumbs. Press the mixture into a pie dish and place in the freezer to set. To make the filling, heat the coconut cream and pour over the dark chocolate chips. Cover for a few minutes until the chocolate begins to melt on its own. 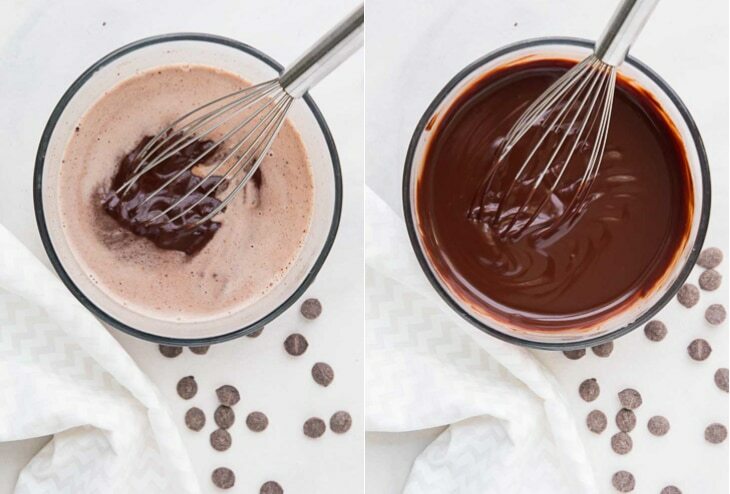 Stir until you get a creamy smooth chocolate mixture. Pour the chocolate filling mixture into the pie crust and place in the fridge for a few hours to set! 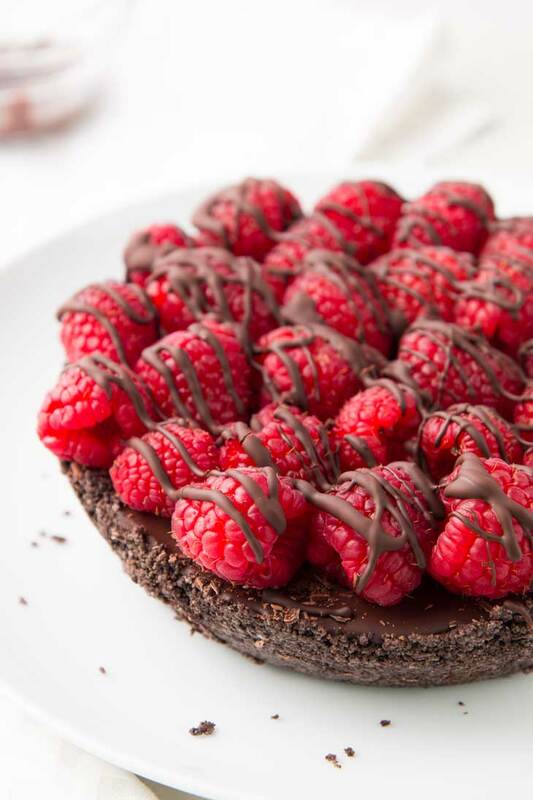 Top with some raspberries and drizzle on melted chocolate. 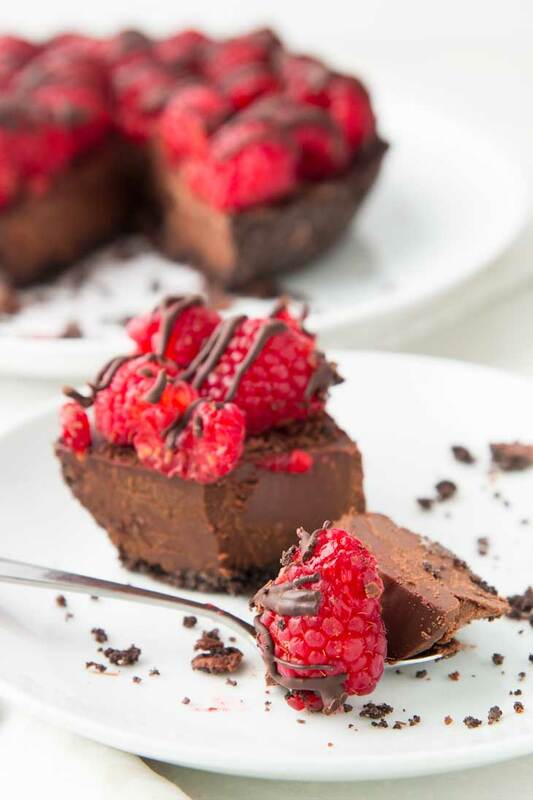 Serve with some vegan whip cream for the easiest decadent chocolate dessert you’ll ever make! If you’re nodding your head to any one of these reasons below, grab the ingredients for this recipe and make it this week! Need a quick and easy dessert for two. Love chocolate but are craving something more than just chocolate chips or a chocolate bar. Want to surprise your loved ones this month with the most decadent chocolate dessert. Want to make dessert for Valentine’s Day but hate baking. Have allergies or dietary restrictions but don’t want to feel left out. Need a dessert fix, but want something healthier and cleaner than what you’ll find at most grocery stores. Whether you’re vegan, gluten-free, have nut allergies, or are simply looking for an easy decadent dessert to make any time, this chocolate recipe is for you! Let me know what you think in the comments below! You can also tag me on Instagram with any re-makes, @vegetariangastronomy so I don’t miss it, as I love sharing them! Or you can help me spread the word about my recipes on Pinterest and Facebook! 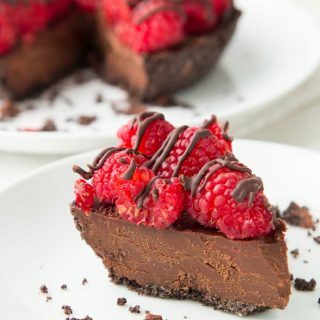 No one needs excuses to enjoy chocolate, especially when you have this decadent easy no-bake Vegan Chocolate Pie recipe! It's allergen-friendly, quick and easy to make, and the perfect dessert for two or chocolate fix for any time of the year! 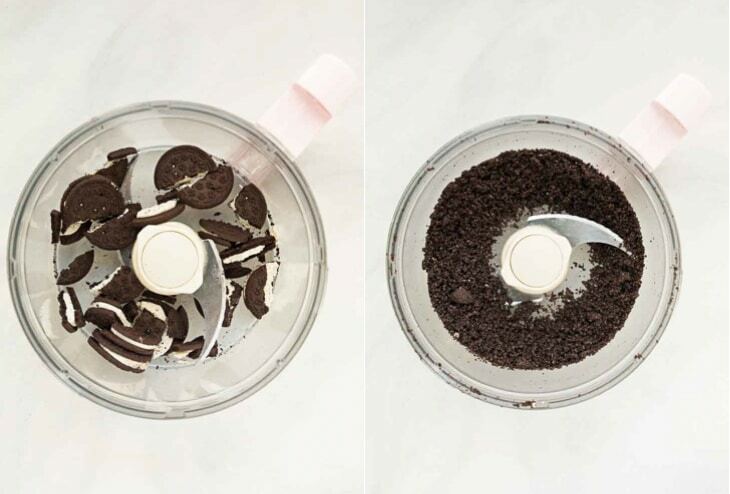 Pulse the oreo cookies in a food processor until they turn into fine loose crumbs. Add in the melted vegan butter, and pulse a few more times until mixed in with the oreo crumbs. Press the mixture into a mini 6" pie dish and freeze for 10-15 minutes while you make the filling mixture. Add the chocolate chips, maple syrup, and a tiny pinch sea salt into a glass bowl. Heat the coconut cream in a small saucepan until it just starts to simmer. Immediately pour the coconut cream over the chocolate chips. Cover and let it sit for a few minutes. Stir the filling mixture until it's completely smooth and all the chocolate chips have fully melted. To prepare the pie, pour the prepared chocolate filling into prepared oreo crust mini pie dish and spread until you get a uniform layer. Place the pie in the fridge for a few hours or overnight to allow the chocolate filling to fully set. Once set, top with a layer of raspberries. (optional) Microwave a small handful of chocolate chips in 30 sec. increments until fully melted and drizzle on top of the raspberries. Slice and enjoy straight from the fridge with some vegan whip cream! This recipe makes a mini 6" size pie. You can easily double the recipe for a larger glass pie dish. Cookies - I prefer to use Oreo cookies, or something similar for the pie crust. You can easily use any hard chocolate cookie as well. Gluten-Free - be sure to get gluten-free cookies for the pie crust. Coconut Cream - make sure the coconut cream is fully mixed through before using. I am literally drooling over this amazing pie! It looks like the perfect chocolate pie. So delish!!! I'm sure the dark chocolate and orange would also be a wonderful combination.